Daniel J. Mahoney holds the Augustine Chair in Distinguished Scholarship at Assumption College. He is the author, most recently, of The Conservative Foundations of the Liberal Order (ISI Books, 2011) and The Other Solzhenitsyn: Telling the Truth about a Misunderstood Writer and Thinker (St. Augustine’s Press, 2014). 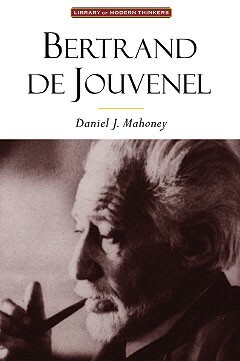 Excerpted from Mahoney's excellent book, Bertrand de Jouvenel and . The Intercollegiate Review (IR) published by Intercollegiate Studies Institute (ISI) which is dedicated to advancing the principles that make America free, virtuous, and prosperous. ISI shared this article with the editor of ARRA News Service. Tags: A Thinker You Should Know, Bertrand de Jouvenel, Daniel J. Mahoney, book excerpt, ISI, Intercollegiate Studies Institute, Intercollegiate Review To share or post to your site, click on "Post Link". Please mention / link to the ARRA News Service. and "Like" Facebook Page - Thanks!